Here at Casa Owen this past weekend, we got to enjoy a visit from my parents. My dad was celebrating his 75th birthday, and he wanted to share it with us. How cool is that? The boys enjoyed spending time with Nana and Pop again, and so did we. 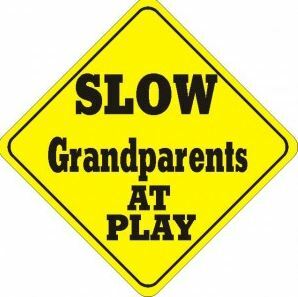 It got me thinking about grandparents generally, and what a treasure they are. I grew up knowing only two grandfathers (each of my grandmothers had died long ago). One grandfather lived far away and I only saw him a handful of times during my entire childhood, but the other grandfather, “Grandpop,” lived close enough that he was a regular fixture in my childhood: babysitting or driving me to appointments when both my parents were at work, telling me stories of his days in the coal mines, sharing silly jokes, giving me big hugs. He had his own set of eccentricities, too. One particularly cute one was that he never rang the front doorbell when he came to visit. If he brought my aunt with him, she would ring the bell, of course. But if he came alone, he would park the car (he called it “Bessie”) in front of the house, and sit inside it until we noticed he was out there and went out to greet him. In nice weather, he would get out of the car and walk around in the backyard until someone spotted him. When I was 18, he died of lung cancer, brought on by miner’s “black lung” and a lifetime of smoking unfiltered Camels. My dad inherited his car, a big green Chevy Nova. Sometimes, for a split second, when I’d see it parked in front of the house, I’d think Grandpop had come to visit and was waiting for someone to go out and greet him. Grandparents are precious. Hug them close. 1. They are either retired or semi-retired, so they have more time to spend playing with you. 2. When Mom or Dad says “no,” Grandad says “yes.” Hey, if you’re sick to your stomach later, that’s not his problem. 3. You are the center of their world, and they like to knit/bake/send stuff to you. 4. Their house is so cool. Childproofing? What’s that? 5. Since their joints are stiff, you can always beat them at a game of tag, and they don’t mind. (They never seem to find you at hide-and-seek, either. Must be their poor eyesight). 6. Your artwork is plastered on their refrigerator, and pictures of you are everywhere. 7. When you come to visit, they stock up on all your favorite foods. 8. Because they are old, they forget the knock-knock jokes you told them the last time they saw you, and now you can tell them all over again. And they still find them funny. Strangely, they do remember cool stories of when they were kids 50/60/70 years ago, which you love to hear them tell over and over again. 9. They’ve seen it all, so that new mowhawk you got doesn’t faze them. 10. Because they’ve been through it all, they know how to take advantage of a fun moment. Here’s an example of an elderly couple playing the piano in the lobby of the Mayo Clinic (if one of them is there for a medical problem, you sure can’t tell!). I’ll bet these folks are fun grandparents! 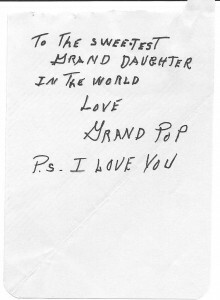 So, what made/makes your grandparents special? What special memories do you have? I’d love to hear from you! 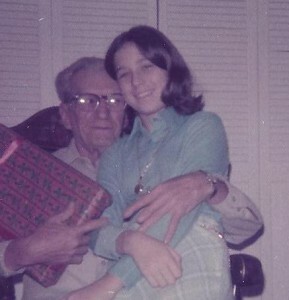 Love the pictures – especially you and Grandpop! Your post reminded me of some great times with my own grandparents – it set my day in a better direction. Thanks! 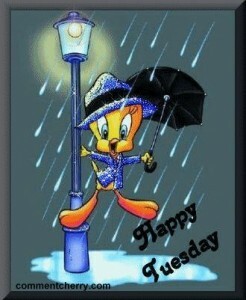 Happy Tuesday! 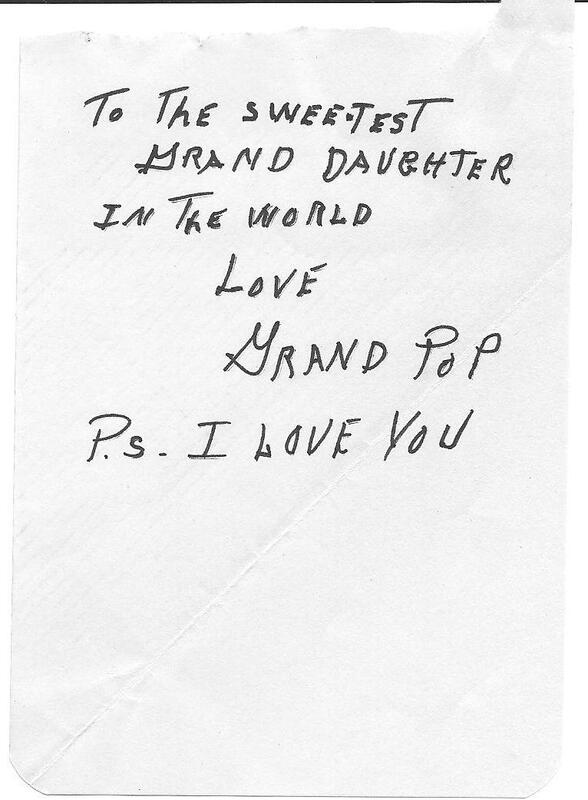 I loved all 4 of my grandparents, and I can hardly talk about them without tearing up. I wish they could be here for Cal’s bar mitzvah. They would be so proud — another generation keeping the Commandments. I know what you mean about wanting so badly to share those special moments with loved ones who aren’t with us anymore. I’m sure they are VERY proud of Cal, and the next generation to honor the tradition you all cherish. What a gift that is! Gosh, my paternal Grandfather used to have foot races with us – and win! He managed a farm for the Massey family and he let us ride his draft horses and the odd bull. We’d take his 4-wheeler for a spin in the cornfield. My mother used to have a heart attack every time she’d hear about our adventures. My maternal grandmother taught me to knit, wrap presents with half a roll of tape, that it’s OK to sit in a perfectly quiet apartment and read a romance novel, and she knew the history of every soap opera EVER! Lisa, your grandfather sounds like such a cool guy – not many of us get to ride a bull or a 4-wheeler in a cornfield, LOL! Between him and your grandmother, it sounds like you had some wonderful grandparents. Thanks for sharing with us! oh what wonderful memories, Kathy. My dad’s parents were here in town and I have wonderful memories of them. when I took my first vacation, I went with them, on the bus to see relatives in Washington. In retrospect, they paid for almost everything but I felt so grown up, because i was paying much of my own way. yeah right. That sounds so cool, Louise! I know what you mean about feeling grown up, LOL. It’s fabulous to have family outside of one’s parents, because it feels like an adventure, but it’s still safe and secure, too. Thanks for sharing such special memories. Awwww!! What a great post! You are so blessed to have had time and closeness with your granddad. He sounds fabulous! And LOVED your top 10 – every single one is true. LOL! My other set, lived about a 15 hour drive so I didn’t see them often either and my grandpa died when I was around 12 years old. But, I did get to know my Grandma Hartford pretty well spending summers with her and going for long weekends as an adult. And I will ALWAYS treasure those times and those memories. She was diabetic and was ALWAYS eating sweets with the “you gotta treat yourself once in awhile” justification. We still quote her often!!! GREAT post Kathy….sniff…loved the trip down memory lane! It’s a shame you didn’t get to spend time with your other grandparents, but at least you had Grandma Hartford! She sounds like a special lady! Thanks so much for sharing, Natalie! Your Grandpop sounds awesome! And that’s such a wonderful video. I love that. It’s all about the timing, isn’t it? LOL! Yes, I’m looking forward to being a Nana – SOMEDAY. You’ll make a terrific Granny, Piper! I’m so glad you stopped by for a visit – thanks! I loved this post. One of my grandmothers always referred to me as her little princess. I think that just about sums up the grandparent/grandchild relationship. I’ve loved seeing my own parents with my kids. Wish I was still someone’s little princess! I only ever knew my grandmothers. Both grandfathers died very young. But I feel like I knew them both from stories told by my parents and relatives. Here’s a story I wrote some time ago about my grandfather on my Mom’s side. Hey, Steve, I just read your post – sounds like a cool guy you’d want to know! Thanks so much for sharing it. Great post! It’s wonderful to have grandparents that leave you with special memories and that’s something I try to do with all six of our grandchildren. I had wonderful grandparents and now it’s my turn! Right now our two youngest are 2 and 4 (I call them the Adorables and they just are!) and I spend a day with them once a week … my special indulgence! They are a tonic and the best way to keep a person young. Just you wait! Wow – six grandchildren! That’s terrific, and so special to make time for them on a regular basis. Thanks, Patricia. Enjoy them! My maternal Grandmother was not the granny type at all. We had something of an interesting friendship when I was a young boy. She would buy me nice clothes and take me out on Saturday nights to interesting night clubs in Manhattan where she knew the staff and they would ignore the presence of a small minor at her busy table. I learned how to quickly flip open a nice silver lighter that she gotten me for my sixth birthday and have a flame waiting as a woman lifted a cigarette to her lips. She told me to look them in the eyes as I held the lighter up for them. She taught me how to order and drink Ginger Ale on the rocks without guzzling it and how to properly handle dinner table settings with too many utensils. She was a bit crazy but I learned a lot about people from her and her club friends. She left me with an ability to comfortably navigate loud parties and night clubs. My maternal Grandmother taught me the fine art of dry Spanish humor. She helped teach me to not hang out in night clubs and to avoid women that that hang out in night clubs all night. She taught me how to handle utensils European style. She gave me my first copy of Cervantes’ Don Quixote de La Mancha in original text. She gave me a copy of El Cantar de Myo Cid in late 12 century Castellano text and had me read it to her. She left me with a love of mid evil Spanish literature and an appreciation for quiet spaces away from any night club or party noise. I LOVE that video, Kathy! There’s nothing like grandparents! 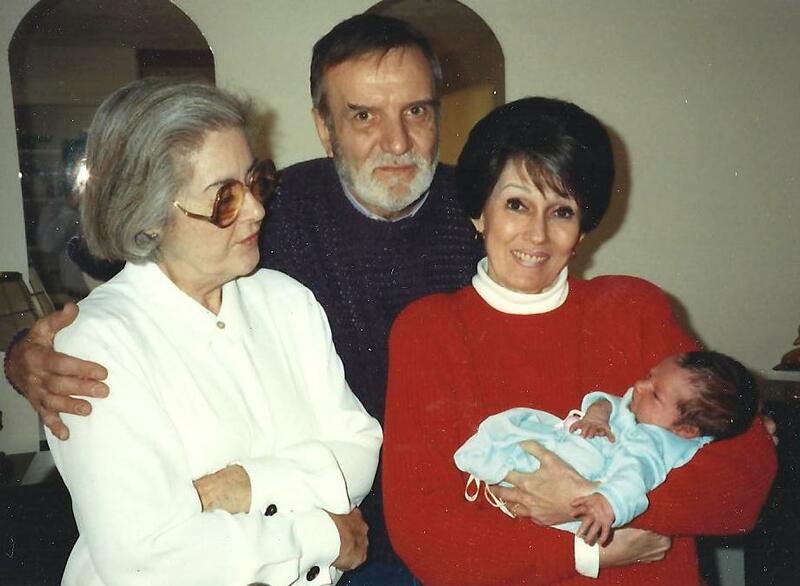 My grandmas outlasted my grandpas, but my memories of all of them are so special. There is simply no one as rich in knowledge and great stories as that older generation. I agree, Jenny! Can you believe someday that might be us they say that sort of thing about? LOL! I’m “fashionably” late to the ROW80 party: did I miss the Easter bunny?